Home / Contest / foods / restaurant / Get a chance to win an iPad 2, an iPhone 4, a DSLR camera, a shopping spree, or a trip for two to Boracay from Pizza Hut Tuscani! 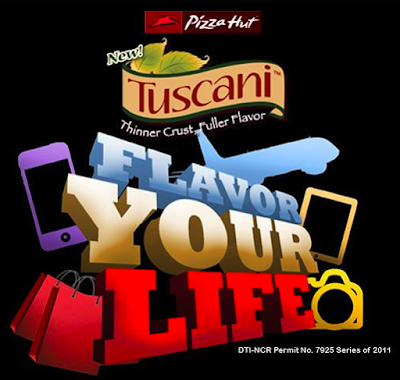 Get a chance to win an iPad 2, an iPhone 4, a DSLR camera, a shopping spree, or a trip for two to Boracay from Pizza Hut Tuscani! Click the "SUBMIT" link on top to submit an entry. Bloggers choose which Tuscani pizza and prize they would like to win. Blog about why you like the Tuscani pizza flavor you chose and how winning your chosen flavor prize will add flavor to your life. Blog entry should be at least 500 words long. Must include a photo featuring their chosen tuscani flavor. Posts are not limited to just text and images. Video blogs can also be submitted. The more creative, the better! Submit your entry to pizzahutflavoryourlife.tumblr.com by clicking on the Submit button. Follow the prompt in uploading your blog entry. Blog entries can be viewed in the microsite. People can also vote on their favorite entries by Liking it. Only users with existing Tumblr accounts can Like posts. One blog post per Tuscani flavor will be chosen. A blogger can only win once for the duration for the promo. If a blogger has multiple entries for multiple flavors/categories, he/she can only win in one. All prizes are NOT convertible to cash and are NON-TRANSFERABLE. Winners will be the one to shoulder the 12% Tax for the prizes that they will win. Contest is open to all Filipino citizens aged 18 and above. Deadline for submission of entries is on Dec. 8, 2011. Promo period is from Oct. 26 – Dec.8, 2011. Judging of entries will be on Dec. 8, 2011 at the Philippine Pizza, Inc office: 15/F Aurora Tower, Araneta Center Quezon City. Announcement of winners is on Dec. 9, 2011. Claiming of prizes will be at the Philippine Pizza, Inc office: 15/F Aurora Tower, Araneta Center Quezon City. Winners should bring 2 valid IDs as well as photocopies of said ID. Winner must personally claim their prize. Prize must be claimed within 60 (sixty) days from notification of winner, otherwise prize will be forfeited. This promo is approved under DTI-NCR Permit No. 7925 Series of 2011.